When I buy fresh herbs to use in my recipes, I rarely ever use them all up. They’ll sit in my fridge until I see them sitting there, sad and wilted, and I end up throwing them in the compost. A recent recipe called for a few tablespoons of fresh cilantro. The big bundle was almost untouched and I had an idea. Why not add them into a soap and see what happens? Thus, this batch of Lime Cilantro Soap was born. It turned out fabulous and smelled divine. I discovered melt and pour soap base at Michael’s during one of my recent Saturday shopping trips. I bought the Shea Butter soap base and planned to make a few different soap recipes with it. Lime and Cilantro Shea Butter Soap was a spur of the moment choice that ended up working out for me. In a microwaveable bowl, add your cubes of shea butter soap base. Microwave on high for 30 seconds. Microwave an additional 10 seconds and check to see if it’s melted. Repeat for another 10 seconds until it’s melted. Stir. Add in drops of lime essential oil and cilantro and stir. Carefully pour into soap mold. Let sit for 40 minutes to an hour before attempting to remove it. I have a large collection of essential oils from last year when I was buying them like crazy. I’m glad I discovered how easy it is to make your own soap so I can use them up. This particular recipe uses lime essential oil. I made four bars of soap in this recipe. I would make this again if I was going to be giving some away as gifts to friends and family. Fresh herbs don’t last as long in soap so you’ll want to use it right away and throw out after a month. 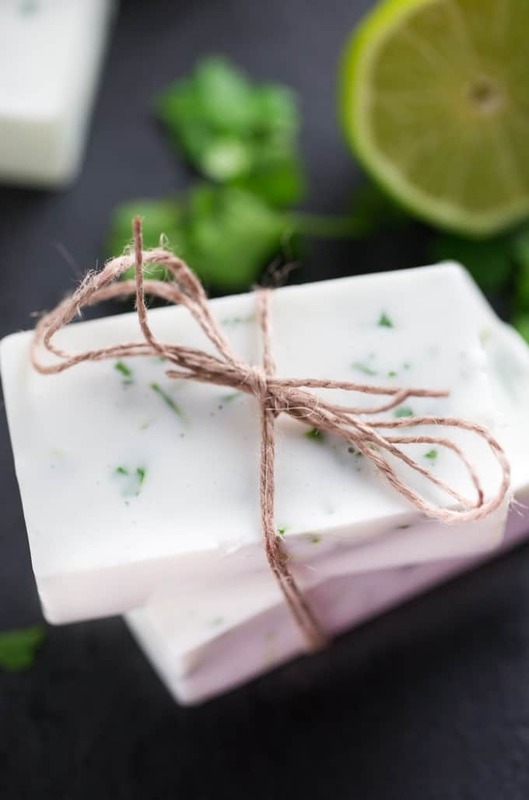 To make one bar of soap, follow this formula: 4 cubes of Shea Butter Melt and Pour base, 5 drops of lime essential oil and 1 to 2 tsp of fresh cilantro. I love the silicone soap molds because they are so easy to remove. The plastic ones are a struggle for me. The soap smells fresh, clean and the shea butter makes my skin feel soft. I have a bar in my kitchen now for hand washing. Next time, I have leftover herbs, I’ll try another variety! I’m thinking rosemary might be a nice scent. What do you do with your leftover herbs? i bet that smells refreshing…..
Ha, I read the title wrong at first, I thought is said Lime Cilantro SOUP. I thought how odd but soap makes much more sense! 🙂 Love to try it out! I bet that soap smells good, definitely a different combination but a good idea! I would love to try making some handmade soap. Thanks for sharing! I also misread it and initially thought this was a soup recipe… but am just as happy with it as soap! Have always wanted to make it from scratch but the idea of a lye explosion has kept me far from it. Will have to look into the melt and pour option! Love the smell of lime! I have been wanting to make my own soap for forever! Reading this article has given me the boost that I need. Now I know where to go to find ingredients I need to make easy and fragrant home made soap! Thanks! What a delicious sounding soap! Almost want to eat it! Oh gosh – that would smell lovely! 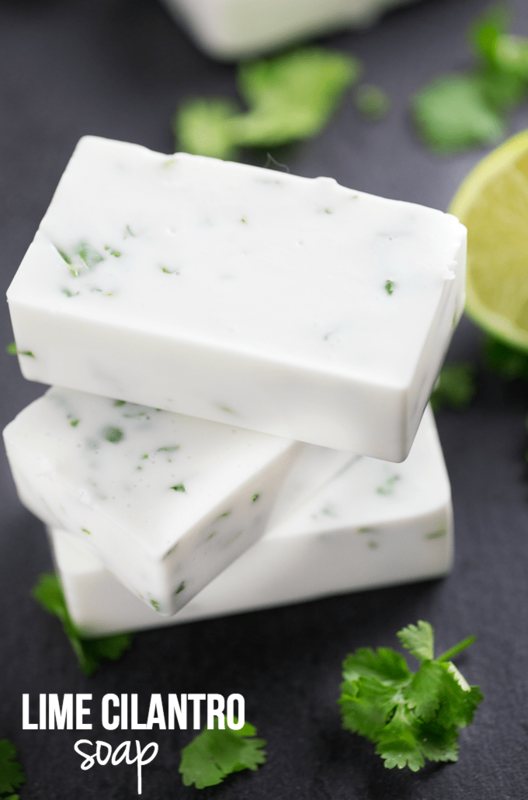 This cilantro soap sounds refreshing. Thanks for sharing. #2usestuesday link up. Wow…I’ll bet this soap smells amazing!!! I’ve never made soap before but I’d love something like this for my guest bath! I love making soap and this looks awesome! Feel free to link up with us at The Alder Collective Link Party http://lifeonmerlin.com/the-alder-collective-link-party-24/! I had no idea that soap could be made so easily. My Mother loves different types of bath soaps so this will be great for making her gifts that she will actually use. Thanks so much. Love this–I love making soap! My husband would love the lime and cilantro combination. I just planted to cilantro, so this might be a good way to use it! I’ve never made homemade soap. This one is so pretty and I bet it smells amazing. My mom would love this. I am so loving all of your soap recipes. I love making soaps to give as gifts and this is another winner. I admit I never thought of making my own soap, but reading this, I never knew it could be so easy. And with the Lime? I bet it smells amazing. So glad you shared this with us at the DIshing it & Digging It Link Party. I live in an area (South Texas) where limes and cilantro are everywhere. Stacie I’m going to have start a Pin board just for all your fabulous soap recipes. This one sounds amazing! I’ve gotta get my hinny in gear and try my hand at this. I wonder if there is essential oil of Cilantro? I used to not be a fan of the taste of cilantro but I’ve grown to really like it and it does smell lovely in candles as well. Hello! This is such a nice and easy recipe! Thank you!! I’m making a bunch of these as wedding favors. Do you know how long they can last before giving them away? I want to make sure they are fresh enough when I give them away 🙂 Thank you! Thank you! Because they have fresh herbs in them, they should be used right away. I’d say no longer than 2 weeks. If you want to make them last longer, use dried herbs instead of fresh. My melt and pour does not come in cubes, rather blocks. Are you using the full 2# in this recipe? thanks! I think it’s about half the package so about one pound. Could you use real lime juice instead of oil? I can’t find lime oil anywhere and I so wanted to make this for my daughter in law for Christmas. It might not turn out the same with lime juice. You can buy lime essential oil on Amazon though. How big should the cubes be?